WHAT IS IT? The Dunlop Geomax MX33 front tire is an intermediate-to-soft terrain tire that was built to replace the Dunlop Geomax MX3S. The MX3S has been the tire of choice for many racers over the last few years, including the MXA wrecking crew. The downside of the MX3S was that the side knobs would crack when the tire was ridden on hard-packed surfaces. Dunlop developed the MX33 to improve both performance and durability. WHAT’S IT COST? $110.76 (80/100-21). WHAT STANDS OUT? Here’s a list of things that stand out with the Dunlop Geomax MX33 front tire. (1) Replacement. 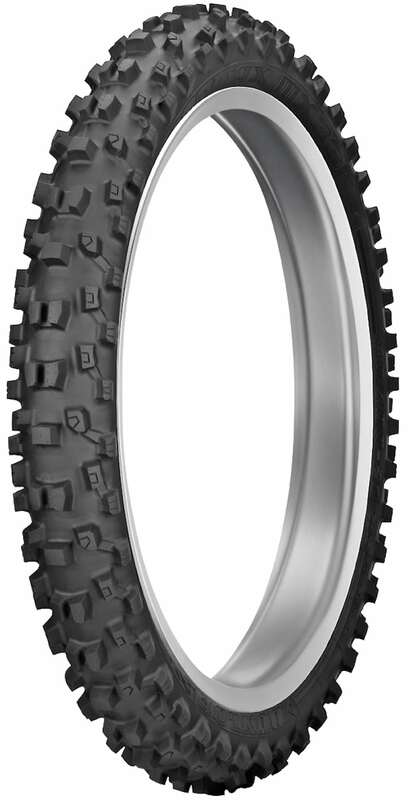 The Geomax MX33 replaces the popular MX3S tire. Dunlop built over 1000 MX33 prototypes before settling on the final product. To beat the rap against the MX3S tire, the main goal of the new MX33 was to improve durability. Geomax incorporated a new rubber compound with a higher molecular-weight polymer and carbon micro particles. They changed the tire’s profile to an “advanced apex design,” which means the MX33 is slimmer but taller. Plus, Geomax not only increased the number of knobs, it varied the height and angles for better grip. (2) Performance. Some test riders noted that in muddy conditions the extra knobs on the sides of the MX33 tire packed in with mud more than the MX3S tire did. That’s inevitable with more knobs and less space between them. On the air-pressure front, we lowered tire pressure by 1 pound in comparison to the pressure we ran in the MX3S’. Test riders reported that the carcass’ sidewall had a firmer feel with less rim roll than the MX3S. On wet dirt, we ran 12 to 13 psi. The MX33’s tire pressure is more critical on hard-packed surfaces—where MXA test riders always run higher tire pressure. If we ran the 14 psi we preferred on the MX3S, the MX33 would push. We found the happy place at 12-1/2 psi. The MX3S looks different and feels different from the MX3S, but once you get used to the feel of it, you find it is more consistent at extreme lean angles. (3) Durability. With the MX3S (originally called the MX32), we tore knobs off the front tire if we ventured on hard-pack terrain for any period of time. And we don’t mean a few knobs; we tore as many as eight knobs off, which we discovered by losing the front end in the first fast sweeper we came to. Based on past experience with Dunlop, we know that they don’t want to sell a tire that loses knobs, even if it’s a great tire. Our MX33s have not shed a knob. (4) Value. 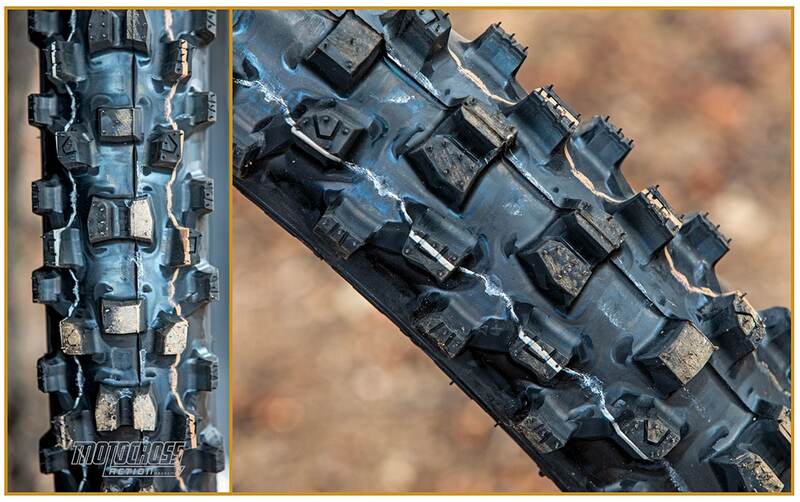 Don’t fret that you can’t get MX3S tires anymore; you will be happy with the new MX33 front tire. The durability is significantly better, and the tire holds its shape for a more consistent tire-pressure feel. (5) Mounting. Don’t forget this front tire is directional. It must go on with the arrows pointing forward. The new Geomax MX33 front tire was notably stiffer when mounting because of the additional knobs on the side. WHAT’S THE SQUAWK? There is a bit more rigidity and harshness on hard-surface tracks. To get the same feel as the MX3S you have to be willing to test different air pressures for each type of terrain. MXA RATING: We loved the old MX3S, but always had to check the side knobs on the front before racing. The good news is that the MX33 offers better performance without the fear of thrown knobs.